This is a horse that we owned before and had a profitable outcome last time. We lost a shake to get him a few races back and this time we got him. 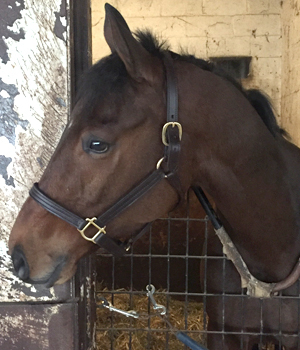 This 5 YO MD-bred gelding has demonstrated incredible flexibility with the ability to perform in almost every setting (short or long, dirt or turf, fast or off track). Has the same sire (Bullsbay) as our past successful claim, Horseshoe Harbour. A True Gentleman is both MD-bred and MD-sired. We expect to be able to race the horse back on short rest and get him into a race in short order. The horse is a "hard knocking horse". He has run on a variety of surfaces, conditions, and distances and performed well with 50% of his outcomes being 4th or better. Beth Worton was excited to get him back in the barn.